The latest release of UK productivity figures highlights the continuing dire performance of the lowest productivity sectors of the economy. A recent report from the Joseph Rowntree Foundation (JRF) demonstrates that workers in retail, hospitality and care all contribute significantly less value per hour worked than the average worker in the UK, and less than their equivalents in on the continent. In Germany, France and the Netherlands, workers in these sectors ‘produce more in four days than British workers do in five’. Increasing the output of workers in these sectors would go some way towards pushing up wages in low-paid jobs and form part of the solution to the ‘productivity puzzle’ that underlies Britain’s economic woes. The problems of productivity in service industries was identified by the economist William Baumol in his famous ‘cost disease’. Whilst advances in manufacturing technology can allow one worker to produce far more output in a given time, this doesn’t apply to every sector evenly. To use Baumol’s own example, despite a massive increase in manufacturing productivity, it still took the same number of people the same amount of time to perform a Beethoven string quartet. But the wages of performers must grow to keep pace with the rest of the economy if the sector is to survive. The process remains unchanged, in terms of its inputs and outputs, even as wages increase and its nominal ‘value’ to society goes up. This problem highlights a puzzle in respect to how productivity, value and wages are linked. This has posed advanced economies a real problem, with sectors such as health and education become increasingly susceptible to the ‘disease’ (as explored in James Meek’s recent investigation into the NHS). As a consequence, they require a growing share of national income to keep pace with rising productivity elsewhere. But alongside these two pillars of the public sector, the low productivity service sectors identified in the JRF report also struggle to keep pace. Whilst this helps make sense of why productivity lags behind in these sectors, it also illustrates how the solution may not be as simple as investing in skills or technology. Despite the complex nature of productivity in service industries, the discussion around it is too often wedded to ideas of the pin makers and their machines. But the cost disease shows us that thinking about low productivity sectors must be done in the context of the whole economy. The value of services provided in sectors like retail and hospitality is ultimately bounded by the ability of others within the economy to pay for them. This can’t be all be addressed by transforming the nature of the jobs themselves, through capital investment and training. If the UK wants to match its European neighbours in terms of productivity, perhaps it should take a wider view of the policies it should emulate – specifically in the context of their lower levels of inequality. The link between inequality and productivity has been the focus of a lot of academic work, but economic studies (such as Faggio, Salvanes & Van Reenan (2007)) tend to look at the relationship from one direction only. In these neoclassical models, wage setting is driven by the marginal productivity of workers. Low productivity sectors then pay lower wages, and wage inequality across the economy emerges from too much low productivity work. But by presupposing the relationship between productivity and the wage level, economists have failed to study its inverse. When inequality is high, many people are unable to pay for the more abstract things (like the performance of a string quartet) that add value to their lives. In an economy where many people struggle with the necessities of daily life, it is not surprising that they cannot afford to privilege the more intangible ways that value can be created. This can be illustrated through the retail sector. Where a broad, well-off middle class exists, there is an ample market for the kind of retail and hospitality services that generate intangible added value within the economy. Productivity increases in the retail sector are frequently seen in terms of firms like Lidl and Aldi squeezing ever finer margins out of low cost goods by cutting back all but the essentials. The inexorable rise of the self-checkout machine is another productivity boosting, if widely despised, intervention in the sector. But a high productivity retail store needn’t look like the budget supermarkets or understaffed corner shops so familiar in Britain’s towns and cities. In countries where more people have more disposable income, shops can afford to improve the retail experience in qualitative terms, offering a more pleasant experience at a slightly higher price. Despite Greggs recently attracting the ardour of young Labour activists, it’s hard to argue that a typical high-street bakery in the UK lacks a certain je ne sais quoi when compared to a French boulangerie. These intangible improvements in quality rely on there being people willing to pay for them, but the ultimate impact on the bottom line is the same – more ‘value’ is created for an equivalent amount of work and productivity goes up. 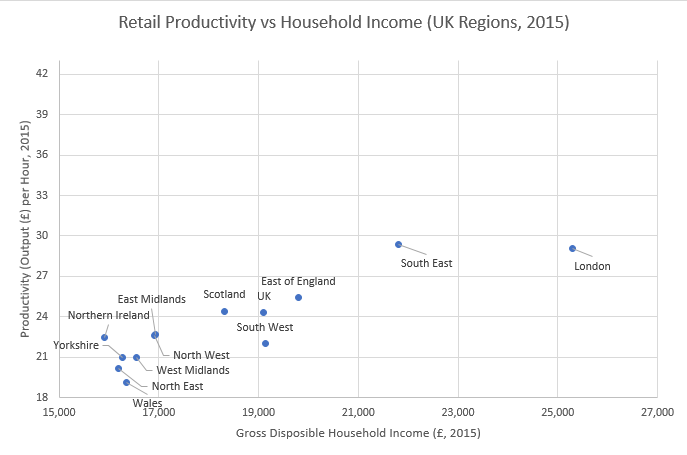 Looking at productivity data from 2015, it’s possible to compare the output per hour with the level of income across different regions. The manufacturing sector traditionally provides relatively highly paid jobs in some of the poorer areas of the country. 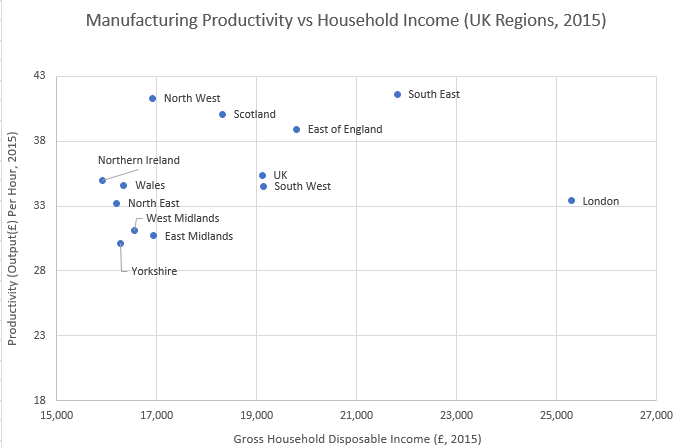 The graph below shows that some of the highest productivity is in areas such as the North West, which otherwise have relatively low incomes. Manufacturing, with its high levels of capital investment and quantifiable end products, fits the traditional narrative of technological improvements leading to greater output. As long as the goods made can find a market, it is in the interest of firms in this sector to make productivity boosting investments wherever possible. The picture in the retail sector, meanwhile, is quite different. Productivity is lower across the board. But here, an obvious trend exists between the overall level of income in a region, and the output per hour of a worker in this sector. An average shop worker in the South East or London ‘produces’ almost £10 per hour more than one in the poorest parts of the UK. Some of this could possibly be explained by beneficial network effects associated with more densely populated areas. But the level of technology or skills in a shop in London aren’t so different from those in Wales that it can explain a 50% increase in the amount of value created per hour worked. When it comes to productivity, confusion can arise if insufficient thought is given to how value is created in the economy, and how that can be measured. Taken at the aggregate, it is too easy to reduce the whole of the economy to a giant workshop, using machines and labour to churn out widgets which have inherent, stable value. This overlooks how much economic activity is focused on meeting more subjective understandings of value that are contingent on people’s ability to pay. In a society where many people struggle to cover the necessities, there is less scope for people to place value on more intangible things like aesthetics, uniqueness or variety. But focusing too much on the material side of value and production restricts potential solutions to the problem of productivity. 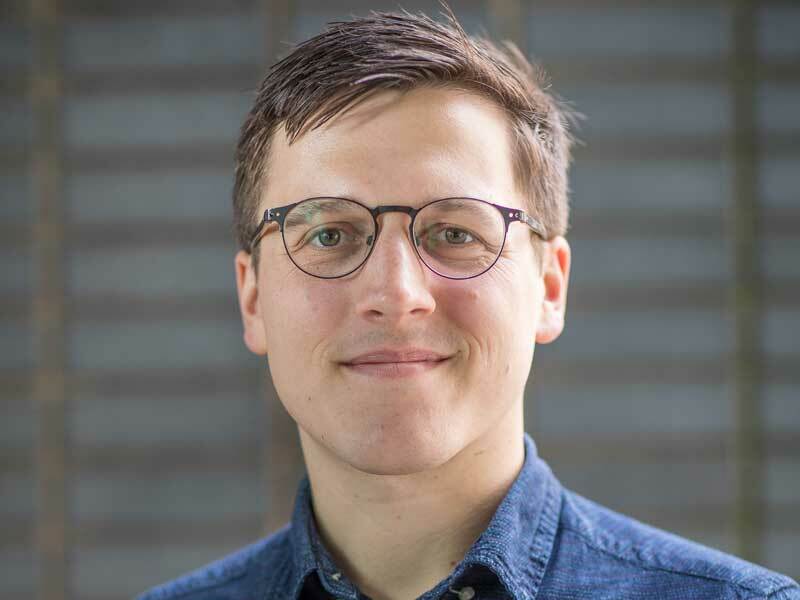 A full frontal assault on inequality through redistribution could spark a virtuous circle, if it allowed people to support a more diverse range of businesses in the place they live. Rather than intensive gentrification of small areas occupied by the lucky few, or the corners of London reserved for Russian oligarchs, a more equal society could give more people the power to send signals through the market about the things they value in their daily life. And perhaps then the country could become more ‘productive’ without a self-checkout machine in sight.